I have previously discussed how blocks aren't "strikes in disguise". While they can sometimes be put to use as strikes, they are, in many cases, unsuited to that purpose. This is because they are often movements that are, for a number of reasons, intrisically defensive rather than offensive in nature. to be a chudan uke? My "strikes in disguise" article dealt primarily with the rising block (age or jodan uke) and its shortcomings as a "weapon" in terms of things like optimal rotation of the forearm vs. striking surface. Other "blocks" have a more fundamental failing when used as "strikes" - and this is their relative "lack of power". This failing is particularly relevant to the "chest level" deflection known as as "chudan uke". Like many "blocks", chudan uke uses a motion that is inherently weak. This has led many people to practise the chudan uke in a way that tries to "wring as much power as possible" out of this movement (resulting in the exaggerated two movement "side swing" I discussed in my articles "Blocks comprise two movements? Dangerous hokum!" and "Why blocks comprise only one movement"). Blocks need power! Don't they? Actually, no. If you read my earlier articles, you'll see that blocks work best as "soft" redirections for a number of very good reasons. And, necessarily, they work less than optimally the "harder" you apply them (or try to apply them). First, this is a matter of efficiency: If you're deflecting you want to focus your efforts on that task - not on "punishing" the attacking limb. The two objectives are necessarily largely inconsistent. If you don't believe me, read my essay "Hard blocks" where I go into the physics in detail. Second, it is a result of effective tactics: As I note in my most recent article: "a block works best when it is barely noticed by the attacker. The less biofeedback your opponent has while he or she is being redirected, the more he or she will not be able to recover from the failure of that attack (at least, in time to offer an effective resistance to your counter)." Again, my "Hard blocks" essay is apposite. Third, it is a function of availability: Noting that a chudan uke seems to require "two movements" (ie. a "move into position" followed by a "deflecting action") to generate any real force is not a "damning assessment" of that movement as a "block". Rather, it is entirely consistent with the fact that the "block" isn't at all dependant on such "force". We all know that you hardly ever have a full range of motion at your disposal to effect a "forceful" block using a "wind up" swing. So what are you typically left with? A much smaller movement. What is this movement good for? Well it is useless for any kind of "strike". It can't effect a "hard block". What is left? You guessed it: a soft redirection. To understand why chudan uke isn't, has never been, and cannot be a "power" movement, you need to look at what muscles are being activated. 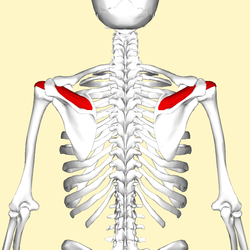 Essentially, the muscles used in the chudan uke motion are almost entirely those comprising the rotator cuff. I won't attempt an anatomy lecture here, so you can research this on your own, starting with the link I've provided. However most martial artists and other physically active people are intimately familiar with rotator cuff strain and injury. Indeed, I once injured my rotator cuff badly while moving a fridge: you don't need to be an athlete to experience this discomfort. It happens so easily - and takes so long to heal. Why? Because the relevant muscles are all in your shoulder. They are small and relatively weak. They are easily over-stressed when we put too much reliance upon them. Put simply, they are not "power" muscles! They work to abduct and rotate the arm - motions that are fundamentally not "load bearing". Yet the primary movement of chudan uke - of both goju and shorin versions - involves an abduction and an external rotation. Furthermore, the preceding "chamber" of the shorin version, as well as the "outward interception" of the goju version, involve an internal rotation. Finally, the secondary movement of both versions involves an internal rotation. So the chudan uke mainly utlises the various rotator cuff muscles, with the primary movement relying, to a large extent, on the smallest muscle of all the rotator cuff group: the supraspinatus muscle. The latter tendency is highlighted in schools where the primary movement of chudan uke is performed without any rotation of the forearm (requiring a great deal more work of the supraspinatus to generate any decent force). Contorting the chudan uke to make it an "uraken"
It's no small wonder then that people who insist on using the chudan uke as a strike have to make some fairly hefty adjustments to the basic form to give it any semblance of "power". Even then, the "uraken" is performed in a manner that is largely unsatisfactory; I think it is patently obvious to all who try this "application" of chudan uke that it feels "weak", even for an uraken. I suspect this is largely because there is at least some attempt to retain the chudan uke mechanics - mechanics that are inconsistent with those of the uraken. Consider for example this chap who interprets the chudan uke in just such a manner (note the stills to the side and below). You'll observe that the technique morphs from its original function as a deflection to something resembling (in a rather crude way) a backfist strike. However the chudan uke is not an "uraken": It does not use a forward or downward moment. Rather it involves a side moment - one that, as noted previously, abducts and rotates the arm. "Ah - but maybe his uraken is different," is one possible response. "Maybe he cuts a different angle and plane of motion. Maybe this is how chudan uke was always meant to be done." differs from his backfist application! Where in the applied version, he does a backfist to his opponent's face, in the "air version" he is clearly doing an abduction and sideways rotation: a rotator cuff movement that is virtually identical to the rehabilitation exercise depicted previously. This approximates (poorly, but still recognisably) the form of the traditional chudan uke. It is not an uraken. Let us be brutally frank: you never want to try a "blow" using such a movement. It isn't strong enough to do diddly squat. No wonder the instructor feels the need to contort it into a backfist strike (which is itself only marginally more powerful - more on that in a second)! "All the more reason to abandon this useless 'chudan uke' nonsense!" is one possible reply. "Maybe the ancients knew this and their 'chudan uke' was always meant to be a full uraken!" But if that were so, why would generations of karateka persist in doing the chudan uke in its "blocking" form - even people like the above fellow (see his "air block")? Is this some sort of "secret" or "hidden technique"? Is every chudan uke really just an "uraken in disguise"? And what's so special about the uraken that the masters of old thought it necessary to "hide" it? It is worth remembering that an uraken isn't exactly a powerful technique to begin with (hence my earlier discussion whether it was a "folly of karate"). At best it will startle an attacker. But it carries almost no "stopping power". In this circumstance, while facing a grab followed by a cross punch, you want to do something that, in the words of Marc MacYoung, "cuts the supply lines". You want something that stops his punch at its source. All that an uraken will do here is give him a bit of nasty "tap" while he is pulverising your face with a full force overhead cross. Now I know that the above fellow's application might still seem effective enough to the casual observer. But let's get real: he isn't even facing a pretend attack never mind a realistic one. The assistant might have grabbed him with a raised hand (as if about to do a cross punch), but he doesn't proceed to do anything after that. He just stands there like a zombie. 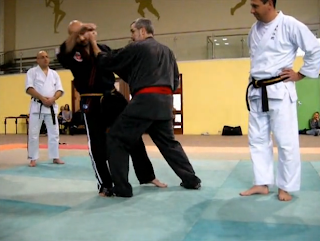 The instructor makes no attempt to defend himself against the possibility of the threatened cross punch : instead he makes the (I think, manifestly flawed) assumption that his counters to the "attacker's" lead arm and the following counter to his face/neck etc. will be sufficiently faster than the threatened cross punch - a punch that, in reality, might follow the grab by as little as 0.16s (160ms) (that's my experience of analysing many surveillance videos in my former job - and I took an active interest in timing unprovoked attacks, noting that they usually took somewhere between 0.16s and 0.3s). Despite these limitations, I suppose you can do an uraken in the move the instructor shows above. But if you're going to do something like that, you're changing the technique: you're playing around with it and creating a variation. You can't do that and legitimately claim it is an "application" of "chudan uke". The variation is far too great. It has no connection with the substantive principles of the chudan uke movement. You aren't just "changing the angles a bit". You're using totally significantly different muscles, direction and emphasis. I have personally been happy to "morph" my chudan uke into an uraken - note for example towards the end of my video below. But I'm honest about what I'm doing. I don't pretend that this is an actual application of chudan uke. Very simply, I've done something other than a chudan uke - in this case for the fun of variation. There is a technique that I once confused for chudan uke, and that is xingyi's heng quan ("crossing fist"). Of all the punches/strikes I've ever learned, heng quan would have to be closest to chudan uke in terms of its movement. Indeed, this is why, as a beginner in xingyi, I (and the other karateka in the class) kept associating the two. This fallacious association was reflected in my technique, earning frequent slaps to my arm from my teacher who would cry: "Bu hao!" (ugly) as he did so. The reason my teacher was so strident in his criticism was that heng quan is almost nothing like chudan uke in its principle. It is a punch forwards that uses a kind of rising, "curved" path. In other words, it is more a forward thrust than a sideways chudan uke. And it is more an uppercut than it is a downwards uraken. So what is the "weak" chudan uke good for? Faced with the above, I think we must conclude that chudan uke is not "uraken" in disguise" just as the heng quan is not a "chudan uke in disguise". Techniques can share some gross mechanics yet still differ substantially in form, structure and concept/objective. Chudan uke is also weaker than both an uraken or heng quan. It is hardly surprising that a technique so lacking in ability to apply force would be "reinterpreted" by modern karateka, particularly those who have no real appreciation of the function and utility (indeed, necessity) of "softness" in martial movement. It is an "uke" after all. And (as many of you know) "uke" comes from the Japanese verb "ukeru" meaning "to receive". I hold it to be self-evident that "receiving" blows (but not being harmed by them) is the cornerstone of arts like karate. This is because they are, first and foremost, about civilian defence - not civilian offence: they teach you how to defend yourself, not how to attack others. And defence in civilian society tends to involve a high degree of response to unprovoked, barely anticipated attacks. "[B]locks offer the key to civilian defence (as opposed to sport or military fighting) - especially where you are faced with an element of surprise in close quarters with little time, opportunity or legal/ethical/moral justification to launch a pre-emptive strike and where you are forced to rely on a withdrawing flinch reflex..."
That so many people would persevere in a traditional art like karate ignorant of this key foundational aspect is perplexing to me. But it does explain the (rather strange) "interpretations" given to an effective and elegant - indeed poetic - technique like chudan uke: the epitome of "softness" in martial arts. For me, chudan uke - in both its major guises - is virtually a defining element of the traditional martial arts. I've seen it in Okinawan and Japanese arts as well as throughout the classical Chinese systems. It always takes the form of one of these guises - or perhaps a hybrid of the two (such hybrids even occur in Okinawan kata - eg. seipai). However in no case except in diluted forms of modern karate does it take on the rather strange, "dead-arm", "side swiping" action I've discussed in this article. And in none of the classical arts is it contorted into some sort of absurd "strike". It is what it is - chudan uke. I've been wondering about the chudan uke in a somewhat different manner. It is plausible that the first half of the movement is the block? As in: Imagine your opponent leads with a left handed strike. As you step forward and off line to your right, you use your right hand to steer the strike to your left. This places the opponent's striking hand within the grabbing range of your left hand where you can control the limb and execute some other technique with the second half of the chudan? In many ways it's like the initial movements to pinan shodan but sped up. I take it you mean the "chamber" (preparing for the side swing) might be a kind of "palm block" pushing a punch to the side. If so, I don't think this is plausible for the reasons I set out in this post on the Traditional Fighting Arts Forums. As you will see from that post, the "first part" of chudan uke is to me nothing more than a "chamber" - a move into position that isn't even part of the actual block. I make this observation comparing the karate techniques with the Chinese martial arts which have similar movements. In other words: that "chamber" is just an exaggerated "move into position" which has become part of the "kihon" of karate (notably only shorin systems - Naha te does not have such a "chamber" at all). Besides, this still leaves all your work cut out for you in terms of making the (very weak) chudan uke movement into a strike. I'm sorry, but it doesn't make any sense to me - not when chudan uke is so potent as a "soft" deflection! It just doesn't require "reinvention" to work.